We are holding drop-in events to assist in restoration of Bruce Vento and Trout Brook Nature Sanctuary. No experience is necessary- this is a great activity for anyone who wants to get outside, explore a new park and learn about restoring our natural areas. Registration: Help us determine the amount of supplies we need to bring each week. Who: Individuals or small groups. If accommodations are needed please let us know. Why: Our nature sanctuary's are home to a diverse native prairie plant community. Volunteers play a huge role in restoring this park’s native habitat. They help us control invasive species such as crown vetch, bird’s foot trefoil, spotted knapweed and musk thistle constantly threaten the integrity of the native plant community! Explore a new park, give back to the community, be outside and meet awesome people! Bruce Vento Nature Sanctuary (293 Commercial St, Saint Paul 55106). CLICK HERE for a map of the meeting location. Trout Brook Nature Sanctuary (1200 Jackson St, Saint Paul 55117 ) CLICK HERE for a map of the meeting location. What to Bring: All tools will be provided. We ask that you bring full water bottles, wear long pants and closed toed-shoes. Please dress for the weather. 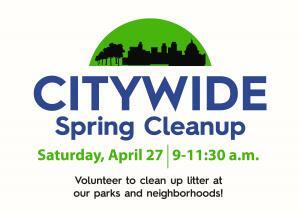 Join forces with family, friends and neighbors for the 33rd annual Citywide Spring Cleanup on Saturday, April 27, 2019 from 9-11:30 am.